AKA: Exos;PWN-4. Status: Retired 1965. 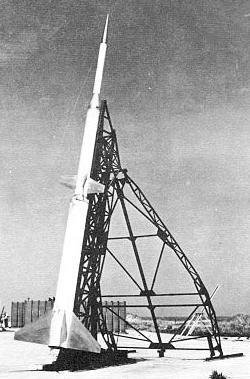 First Launch: 1958-06-26. Last Launch: 1965-11-02. Number: 10 . Thrust: 365.00 kN (82,055 lbf). Gross mass: 2,600 kg (5,700 lb). Height: 12.90 m (42.30 ft). Diameter: 0.58 m (1.90 ft). Apogee: 600 km (370 mi). The Exos sounding rocket was developed by the University of Michigan under a contract from the Air Force Cambridge Research Center. The three fins of the Nike booster had to be replaced by four new clipped-delta fins. First flight test of an all-up Exos rocket occurred in June 1958. Exos was zero-launched from a rail launcher. The Exos sounding rocket was developed by the University of Michigan with the assistance of NACA under a contract from the Air Force Cambridge Research Center (AFCRC). It was a three-stage rocket combining an M6 Honest John (see M31-MGR-1A) first stage, an M5 Nike Ajax (see SAM-A-7-MIM-3) second stage and a Thiokol XM19 Recruit as third stage. The three fins of the Nike booster had to be replaced by four new clipped-delta fins. The Exos is very similar, but not identical to the Aerolab Co. Argo C-1, which used the same combination of rockets, but a slightly different aerodynamic design. The first flight test of an all-up Exos rocket occurred in June 1958. After zero-launch from a specially built rail launcher, the first stage burned for about 4.4 seconds, after which it was separated from the vehicle by aerodynamic drag. After 25 seconds of coasting, the second stage fired for about 3 seconds, followed by separation and almost immediate firing of the third stage for further 1.6 seconds. The third stage and payload nose cone then continued to coast to an apogee of about 480 km (300 miles) (for a 23 kg (50 lb) payload). In April 1959, the USAF allocated the formal research missile designation XRM-86 to the Exos at the request of the AFCRC, and in June 1963 this designation was changed to PWN-4A. At least eight research flights of XRM-86-PWN-4A vehicles were launched from Eglin AFB between February 1960 and November 1965, mostly with ionosphere research experiments as payload. More at: Exos sounding rocket. Family: pad-launched. Country: USA. Launch Sites: Wallops Island, Eglin. Stages: M-6, M5E1, Yardbird. Agency: Michigan. Bibliography: 2, 563. 1958 June 26 - . Launch Site: Wallops Island. LV Family: Honest John. Launch Vehicle: Exos sounding rocket. Model 1 test - . Nation: USA. Agency: AFCRL, NASA. Apogee: 370 km (220 mi). 1958 September 25 - . Launch Site: Wallops Island. LV Family: Honest John. Launch Vehicle: Exos sounding rocket. Model 2 test - . Nation: USA. Agency: AFCRL, NASA. Apogee: 460 km (280 mi). 1960 February 19 - . 17:18 GMT - . Launch Site: Eglin. LV Family: Honest John. Launch Vehicle: Exos sounding rocket. FAILURE: Failure. Chemical release mission - . Nation: USA. Agency: USAF. Apogee: 37 km (22 mi). 1961 August 11 - . 14:30 GMT - . Launch Site: Eglin. LV Family: Honest John. Launch Vehicle: Exos sounding rocket. Ion density Test / ionosphere mission - . Nation: USA. Agency: USAF. Apogee: 114 km (70 mi). 1962 August 3 - . 17:46 GMT - . Launch Site: Eglin. LV Family: Honest John. Launch Vehicle: Exos sounding rocket. Bipolar Probe Ionosphere mission - . Nation: USA. Agency: USAF. Apogee: 365 km (226 mi). 1962 October 25 - . 06:00 GMT - . Launch Site: Eglin. LV Family: Honest John. Launch Vehicle: Exos sounding rocket. Ionosphere mission - . Nation: USA. Agency: USAF. Apogee: 669 km (415 mi). 1963 July 25 - . 22:38 GMT - . Launch Site: Eglin. LV Family: Honest John. Launch Vehicle: Exos sounding rocket. Refractive Index Ionosphere mission - . Nation: USA. Agency: USAF. Apogee: 623 km (387 mi). 1965 May 25 - . 23:20 GMT - . Launch Site: Eglin. LV Family: Honest John. Launch Vehicle: Exos sounding rocket. EM Absorption Ionosphere mission - . Nation: USA. Agency: USAF. Apogee: 488 km (303 mi). 1965 May 26 - . 23:20 GMT - . Launch Site: Eglin. LV Family: Honest John. Launch Vehicle: Exos sounding rocket. 1965 November 2 - . 20:00 GMT - . Launch Site: Eglin. LV Family: Honest John. Launch Vehicle: Exos sounding rocket. IQSY 30-kg Sphere Aeronomy mission - . Nation: USA. Agency: USAF. Apogee: 686 km (426 mi).